A MiniDisc (MD) is a magneto-optical disc-based data storage device initially intended for storage of up to 80 minutes of digitized audio. Today, in the form of Hi-MD, it has developed into a general-purpose storage medium in addition to greatly expanding its audio roots. 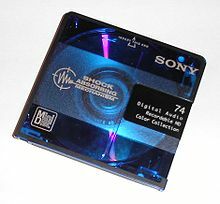 MiniDisc was announced by Sony in September 1992 and released that November for sale in Japan and December for the USA and Europe. The music format was originally based exclusively on ATRAC audio data compression, but the option of linear PCM recording was ultimately introduced to attain CD-quality recordings. MiniDiscs were popular in Japan and Asia as a digital upgrade from cassette tapes, but were not as popular elsewhere.